Not long after Mexico won its independence from Spain in 1821, hundreds of hardy frontiersmen from the United States settled in Texas after the Mexican government made them an attractive offer. Fertile land and protection by a fair and stable government was promised to anyone willing to establish a homestead in Texas, and soon more than 25,000 colonists from the United States were in Texas, forging a new life alongside their native-born Mexican neighbors. By 1830, however, Pres. Antonio López de Santa Anna had assumed dictatorial power in Mexico. His policies and those of the new “Centralist” government were enacted to terrify the American colonists (Texians) and Mexicans (Tejanos) who were seeking protection of the rights originally promised to them by the Mexican government. What resulted was the Texas Revolution—the bloody battle for the Alamo and the Battle of San Jacinto—effectively ending Mexican control of the province and giving rise to the Republic of Texas. Unlike many of its predecessors in the study of the Texas Revolution, this detailed and candid history provides a focused study of the lesser-known frontiersmen and their Mexican allies, along with the women and children they protected. 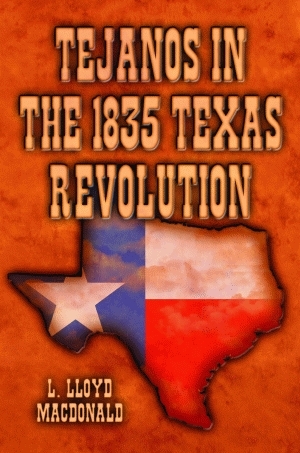 Rich in first-person anecdotes recounting the years leading up to the fight for the Alamo, the days spent within its walls, and its aftermath, this well-informed chronicle pays long-due attention to the often-overlooked contributions by Tejanos as well as the thirty-two volunteers from Gonzales who determinedly sought to defend their rights. Enhanced by maps and illustrations devotedly handcrafted into leather by the author, this volume stands out as a unique examination of the joint struggle of the Mexicans and Americans who sought to overthrow Santa Anna’s tyranny in the 1830s. L. Lloyd MacDonald is an attorney and writer with a deep interest in the history of Texas. He served in the United States Air Force as a cadet lieutenant colonel and received his law degree from Baylor University. Throughout his life when he wasn’t in the courtroom, he cultivated his love of poetry and devoted himself to his wife and two children.